3 Sided Football – Think three sided. 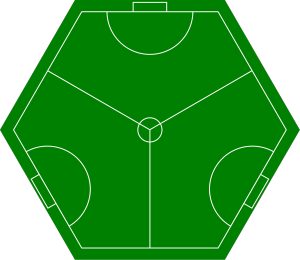 In 3-sided football (3SF), three teams play on the pitch at the same time, and the winner is the team that concedes the fewest goals. Depending on the situation, anyone on the pitch could momentarily be a teammate as you try to score against a common enemy. Be careful though, just how long can you trust them to be on your side…? 3-sided football is a game of tactics, strategy, skill, politics and utter chaos. If you’re looking for a new challenge from the beautiful game, you may have just found it. Eventually this site will be full of 3SF news, stories and history, a lot of which is currently hosted on the New Cross Irregulars website. In the meantime sign up to the mailing list to be kept up to date, and join the Facebook group to join the conversation!